Lynnfield’s first doubles player Michael Gentile prepares to make contact with the ball during their match against Ipswich at Ipswich High School on Monday, May 7, 2018. 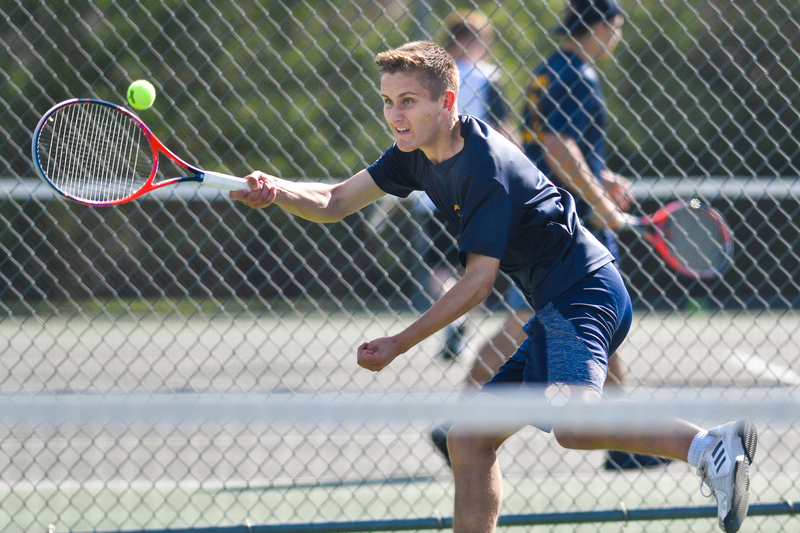 Lynnfield’s first doubles player Lorenzo Russo makes contact with the ball during their match against Ipswich at Ipswich High School on Monday, May 7, 2018. Lynnfield’s third singles player Colin Lamusta keeps his eyes on the ball during their match against Ipswich at Ipswich High School on Monday, May 7, 2018. Lynnfield’s first singles player Max Rothermund reaches to make the return during their match against Ipswich at Ipswich High School on Monday, May 7, 2018. Lynnfield’s second singles player Arlex Correa keeps his eyes on the ball during their match against Ipswich at Ipswich High School on Monday, May 7, 2018.